» What is the thickness of the cell membrane? One of the key defining characteristics of living organisms is that cells are separated from their external environment by a thin, but highly complex and heterogeneous cell membrane. These membranes can come in all sorts of shapes and molecular compositions, though generally they share the property of being made up of a host of different lipid molecules and that they are riddled with membrane proteins. Indeed, if we take the mass of all the proteins that are present in such a membrane and compare it to the mass of all of the lipids in the same membrane, this so-called protein-to-lipid mass ratio is often greater than one (BNID 105818). This assertion applies not only to the plasma membranes that separate the cellular contents from the external world, but also to the many organellar membranes that are one of the defining characteristics of eukaryotic cells. The thickness of this crucial but very thin layer in comparison to the diameter of the cell, is similar to the thickness of an airplane fuselage in comparison with the plane’s body diameter. The key point of this analogy is simply to convey a geometric impression of the thickness of the membrane relative to the dimensions of the cell using familiar everyday objects. In the case of an airplane, the thickness of the exterior shell is roughly 1 cm in comparison with the overall diameter of roughly 5 m, resulting in an aspect ratio of 1:500. How can we estimate the aspect ratio for the biological case? 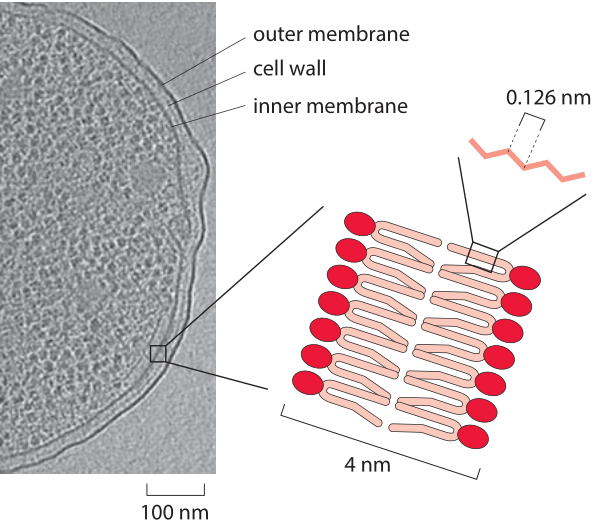 With a few exceptions, such as in Archaea, the lipid part of the cell membrane is a bilayer of lipids with the tails on opposite leaflets facing each other (see Figure 1). These membranes spontaneously form as a relatively impermeable and self-mending barrier at the cell’s (or organelle’s) periphery as discussed in the section on the cell’s membrane permeability. The length scale of such structures is given by the lipid molecules themselves as shown in Figure 2. For example the prototypical phospholipid dipalmitoyl- phosphatidylcholine, has a head to tail length of 2 nm (BNID 107241, 107242). This implies an overall bilayer membrane thickness of 4 nm (3 nm of which are strongly hydrophobic and the rest being composed of the polar heads, (BNID 107247)). For a 2 micron cell diameter (a relatively large bacterium or a very small eukaryotic cell), the 4 nm thickness implies an aspect ratio of 1:500, similar to the case of an airplane. Larger numbers are sometimes quoted probably resulting from the effective increase due to proteins and lipopolysaccharides sticking out of the membrane. For example, the lipopolysaccharide incorporated in the Gram-negative bacterial outer membrane nearly doubles the diameter of the cell. Figure 2: Characteristic relative sizes and shapes of the lipid molecules making up biological membranes. The story of how lipid size was initially estimated has a long and interesting history as vividly described in Charles Tanford’s little book “Ben Franklin Stilled the Waves”. Specifically, the story begins with experiments of Benjamin Franklin who explored the capacity of oils to still the waves. Franklin performed his experiments in a pond near London and said of them, “the oil, though not more than a teaspoonful, produced an instant calm over a space several yards square, which spread amazingly and extended itself gradually until it reached the leeside, making all that quarter of the pond, perhaps half an acre, as smooth as a looking glass.” The calming of the waves is attributed to a monolayer of oil forming on the surface of the water and causing damping through energy dissipation. A similar approach to calming waves was taken by sailors at the time of the Romans by dumping oil (such as whalers using blubber) in rough seas. Energy is dissipated as the oil film flows and gets compressed and dilated during the movement of the waves. Using Franklin’s own dimensions for the size of his oil slick (i.e. ½ acre ≈ 2000 m2) and the knowledge of the initial teaspoon volume (i.e. 1 teaspoon ≈ 5 cm3), we see that his oil formed a single layer with a thickness of several nanometers. To be precise, using the numbers above one finds a thickness of roughly 2.5 nm. More precise measurements were undertaken by Agnes Pockels, who invented an experimental technique used to construct lipid monolayers that made it possible to settle the question of molecular dimensions precisely. Lord Rayleigh performed small-scale versions of the Franklin experiment in an apparatus similar to what is now known as the “Langmuir trough” and permits spreading of a monolayer of molecules on a liquid surface and detecting their presence with a small wire that squeezes this monolayer. Each layer of the cell membrane is made up of molecules similar in character to those investigated by Franklin, Rayleigh and others. In particular, the cell membrane is composed of phospholipids which contain a head group and a fatty acid tail which is roughly 10-20 carbons long. An average carbon-carbon bond length projected on the chain and thus accounting for the tail’s zigzag shape arising from carbon’s tetrahedral orbital shape is lcc=0.126 nm (BNID 109594). The overall tail length is nc x lcc where nc is the number of carbon atoms along the chain length. Overall the two tails end-to-end plus the phosphoglycerol head groups have a length of ≈4nm (BNID 105821, 100015, 105297 and 105298). Unsurprisingly, membrane proteins are roughly as thick as the membranes they occupy. Many membrane proteins like ion channels and pumps are characterized by transmembrane helices that are ≈4 nm long, and have physicochemical properties like that of the lipids they are embedded in. Often these proteins also have regions which extend into the space on either side of the membrane. This added layer of protein and carbohydrate fuzz adds to the “thickness” of the membrane. This is evident in Figure 3 where some of the membrane associated proteins are shown to scale in cross section. Due to these extra constituents that also include lipopolysaccharides, the overall membrane width is variably reported to be anywhere between 4 and 10 nm. The value of 4 nm is most representative of the membrane shaved off from its outer and inner protrusions. This value is quite constant across different organellar membranes as shown recently for rat hepatocyte via x-ray scattering where the ER, Golgi, basolateral and apical plasma membranes, were 3.75±0.04 nm, 3.95±0.04 nm, 3.56±0.06 nm, and 4.25±0.03 nm, respectively (BNID 105819, 105820, 105822, 105821). 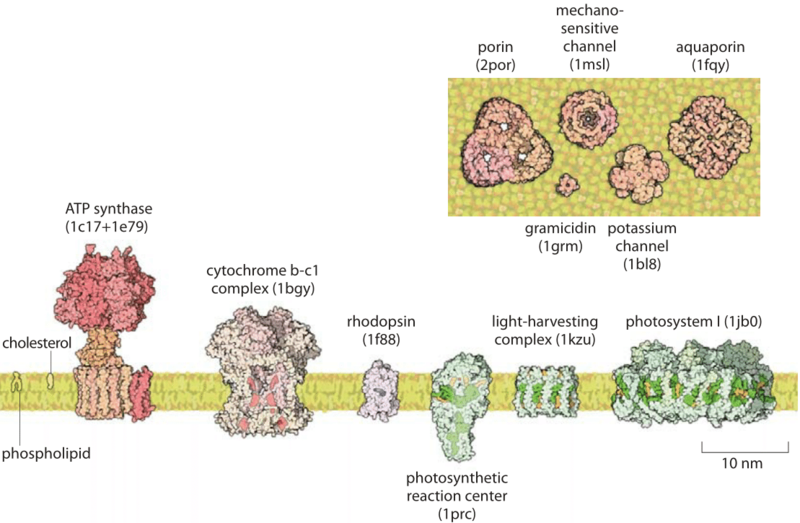 We conclude by noting that the cell membrane area is about half protein (BNID 106255) and the biology and physics of the dynamics taking place there is still intensively studied and possibly holds the key to the action of many future drugs.